A boat certified to carry nine people, able to operate at speed in less than good conditions, and costing less than $50,000 is well worth a long look. 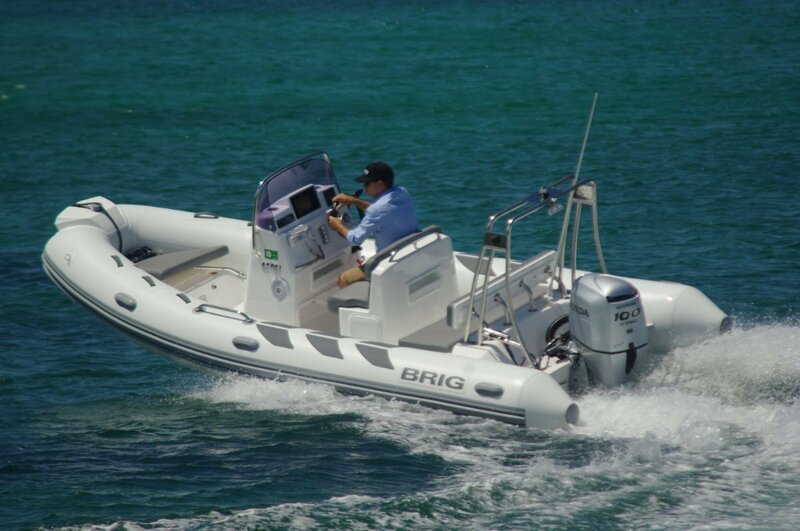 The boat is the Brig Navigator 520. A fibreglass RIB, it is one of a trio of Navigators, the others being a 570 and a 610. The 520 is clearly aimed at the tender market, probably for mother ships around 35 or 40ft. To suit the role it is equipped with davit attachment points and a bow towing ring – which is more likely to be used by smaller cruisers. But it deserves a wider market; within its modest dimensions there is much to like. Nine is the official people capacity and, with a bit of friendly squeezing eight of them could have an upholstered seat. A family would have abundant room. There is a reasonable amount of storage, with lockers fore and aft as well as the interior of the console. Handy glove box-type nooks are fitted ahead of the main seats. Here is a fine family day boat; ideal as a swimming platform or surfboard transport. Divers, of course, love RIBs for their low, soft sides and great stability. Brig appears to expect fishermen to be customers too. The electronics embedded in the dash are well beyond basic and on the way towards serious fish finders. Here are standard provisions that are acceptable to all but the most fastidious of boaters. What look like stainless steel grab handles bonded to the top of the tubes amidships are actually anchor points for the Bimini’s guy ropes. The Bimini and a full boat cover are part of the boat’s standard equipment. There are plenty of real handholds in Hypalon: a row along the top for passengers, more above the wear band at the side – probably for people in the water handling the boat. In stainless steel, again ahead of the main seats, are more handholds. Driving the 520 while sitting is comfortable. There is the right space between seat back and wheel for the human back to be in touch with the former and hands with the latter, and neither stretch nor cramping involved. Sitting, the windscreen does a good job of wind protection. Standing to drive is also comfortable if you like 34 knots of wind in your face. The grab rail surrounding the screen gives fine support. Most 520s are sold with 80hp motors, but the buyer of the review boat opted for the maximum of 100. The hull is well capable of using this much power and showed us a top speed of 34 knots. In a boat this length it feels like a good many knots more (and the owner loves that sensation). As well as navigation lights and aerials, the gantry aft mounts a tow bollard for skiing; casual skiers will appreciate the extra horsepower. 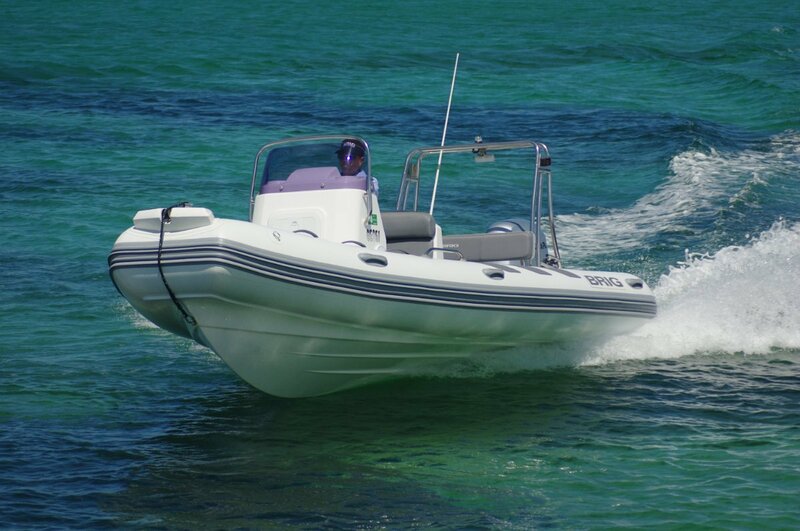 The driving experience was standard RIB – which means good – enhanced by hydraulic steering. The weather was too light to put the boat under any stress; it sneered at the slight sea’s attempts to disturb our smooth ride. Brigs are built in Europe; obvious cues to overall quality are the standard of hardware and stainless steel work. A more fundamental feature is the material used for the buoyant tubes. Cheap imports use PVC (which the sun loves to eat). Not only do Brigs use Hypalon, but French Hypalon – reputed to be about as good as it gets. Within the tubes air is contained in five chambers, making Brigs close to unsinkable. Dry weight is 440 kilos meaning most cars are capable of towing it, and hauling it off the beach is an easy task.